The following books, films, and television shows are excellent sources for psionic campaign ideas and adventure seeds. While much of this fiction is good in its own right, note that some of these were chosen for gaming compatibility over literary excellence. Bester, Alfred. The Demolished Man (Sidgwick & Jackson, 1953). Award-winning novel that explores how telepathy "sounds," among other things. Also see his The Stars My Destination (1956) for a setting with ubiquitous teleportation. Blish, James. Jack of Eagles (Avon, 1982). An up-and-coming esper becomes involved in the conflict between two underground psionic factions. Ties psi to both science and mathematics. King, Stephen. The Dead Zone and Firestarter (Viking, 1979 and 1980). The former depicts precognition as powerful and horrifying, while the latter features a psionic family trying to escape government agents; both film adaptations are worth watching. Lumley, Brian. Necroscope (Tor, 1986) and sequels. Weakly written, but the setting (ESPionage agents fight Cold War enemies and the occasional monster) makes for a wonderful campaign. May, Julian. The Many-Coloured Land (Collins, 1985), Intervention (Collins, 1987), and sequels. Two interweaving series featuring psionic abilities grouped by power, psychic bloodlines, psychotronic amplifiers, and gestalts. McCaffrey, Anne. To Ride Pegasus (Del Rey, 1973), The Rowan (Ace, 1990), and sequels. Two series set in a world in which psi is accepted, understood, and keeps society going. Niven, Larry. Flatlander (Del Rey, 1995). A collection of short stories about Gil "The Arm" Hamilton, a sci-fi/noir detective with modest (but very useful) ESP and telekinetic abilities. Smith, E. E. "Doc." Triplanetary (Fantasy Press, 1948) and sequels. The Lensman series combines space opera with incredibly high-powered psis, and was adapted to GURPS Third Edition as GURPS Lensman. Claremont, Chris; Byrne, John; and others. Uncanny X-Men (Marvel, 1963-present). The Dark Phoenix Saga (1980) makes a good starting point, due to its focus on the psionic Jean Grey and the introduction of the Hellfire Club. Ellis, Warren and Duffield, Paul. FreakAngels (Avatar Press, 2008-2011). Inspired by John Wyndham's novel The Midwich Cuckoos (Penguin, 2000). A dozen powerful psis accidentally ended the world; now they work to rebuild it. Free to read at www.freakangels.com. Akira (Katsuhiro Otomo, 1988). A must-see anime that demonstrates out-of-control psi, secret government labs, and several of the themes on pp. 6-8. Dead Zone, The. See description above. Also a TV series (2002-2007). Fury, The (Brian De Palma, 1978). Thriller about cultivating psis as weapons, with a healthy dose of Your Head Asplode (p. 7). Men Who Stare at Goats, The (Grant Heslov, 2009). A dark comedy poking fun at Project Stargate (p. 5) and the "warrior-monks" who emerged from it. Based on the Jon Ronson nonfiction book of the same name (Simon & Schuster, 2005). Push (Paul McGuigan, 2009). 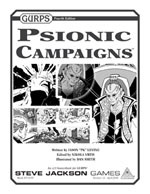 Psychics on the run fight against an evil psionic conspiracy. Shamelessly low-brow, but arguably the purest "psionic action" film yet. Serenity (Joss Whedon, 2005). A black-ops agent hunts a psychic and the secret she accidentally learned. Good depiction of a psi-enhanced warrior and of psi as a sanity-blasting curse. Scanners (David Cronenberg, 1981). 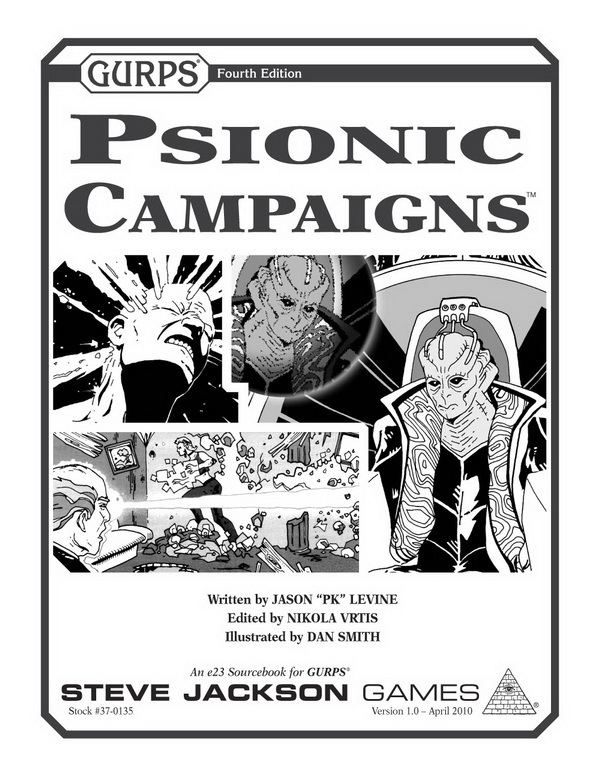 Iconic depiction of psi as horror (see p. 7); it also features the intentional creation of psychics, psychotronic drugs, and psi-versus-psi battles. Star Wars (George Lucas, 1977) and sequels. Heavy use of psi ("the Force") in a space-opera context, including training sequences and telekinetic swordsmanship. X-Men and sequels. (Bryan Singer, 2000-2003). Excellent portrayal of society's fear of the unknown and of how powerful a telepath can be. Charmed (Constance M. Burge, 1998-2006). Three sisters use their psychic powers to fight demons and warlocks in this intentionally cheesy series that happily conflates psi and magic. Roswell (Jason Katims, 1999-2002). Four human-like aliens with extremely versatile psionics hide from the authorities while making friends with humans. Tomorrow People, The (Roger Price, 1973-1979 and 1992-1995, U.S. remake, 2013-2014). This look at the next stage of evolution helped popularize the term Homo superior for psis; the two series take different approaches to the same theme.